One year ago, Sera Murano chose evil. She left her human world behind to transform into an Ensoul, a rare and powerful demon, all to fight the evil she was about to become. Working for her father Lorenzo, the leader of all demons, she secretly vowed to overturn his plot to destroy humankind. That is, until demon hunters attack Sera and her beloved, Damon, and the truth about the human-demon war is revealed. Torn between the human life of her past and the supernatural one she lives now, Sera must decide who is the worse enemy: evil or humanity. To win the battle of her life, Sera is forced to do the unthinkable, taking drastic measures and risking the lives of those she loves most. She must fight to the death against the only supernatural leader she’s ever known, all for a chance to break the cycle of evil. Time was of the essence. Sera burst out of her room and into the hallway and raced down the long corridor. As she reached the winding stairs, she opened her mouth to scream that she was coming for Damon. But before she could say anything, a booming crack silenced her. It bellowed loudly. The noise stopped her in her tracks. She had no idea where the sound had come from. Dazed, she froze in her steps and looked around, trying to identify its source. What was that? Her blood pumped fast through her system. When she took her next step, an excruciating and undeniable agony came over her. She had been attacked. Stars swirled and danced in her vision. Everything dimmed. The back of her head throbbed. The pain pounded in her skull, making a ba-boom sound over and over again. Without further warning, her body gave way, and she dropped fast to the hard floor. As she fell and desperately tried to right herself, she spun on the perfect angle to see the reason for her unfortunate circumstance. He loomed over her, poised for a further assault. Her attacker was a dark, blurry figure. He watched her collapse with his small beady eyes glaring at her from the holes in his black mask. While the hunter's face was obscured, his smile gleamed brightly in the dimly lit house. Sera could have sworn she heard laughter. It was a note higher than she anticipated. She noticed the hunter's right arm; he was positioned ready to strike. He wielded a giant baseball bat, which had just connected with her head. "What the…?” Sera’s rage metamorphosed into energy, thrusting through her like a roaring and violent storm. It readied her body to respond to her attacker. The hunter pulled his arm back slowly until it was raised high above his head. He paused, a cocky move, meant to intimidate her. Unwilling to fall victim to the masked assailant, Sera summoned her supernatural strength once again and pushed herself off the floor to face him. In a flash, he twisted his body and swung the bat toward her. Sera hesitated a beat too long, just enough for the demon hunter to get his wish. She had been mere inches away from an upright stance, when the bat, in full swing, connected with her cheekbone. The impact sent Sera careening backward until she slammed up against a wall. For seconds she teetered on the edge of the top stair. Finally, she lost her battle with her balance and slid off the wall. To save herself, she took a leap, high into the air. But nonetheless, her body tumbled and crashed down the steps of the grand staircase. The fall felt as if it lasted for minutes, but only seconds had passed. Conscious as she experienced her soar through the air, her body twisted and turned as it made its way to the bottom of the stairs. Without warning, her head smashed violently onto the marble foyer entrance. Everything faded to black. Kristina Rienzi is an American author who has been writing in some fashion for several decades. In 2014, she achieved traditional publication for her debut novel, Choosing Evil (Ensouled Trilogy, Book One), and has since independently published, Luring Shadows, Twisted, and Winter Road. 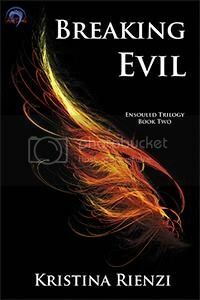 Her latest novel, Breaking Evil (Ensouled Trilogy, Book Two) will be releasing soon. 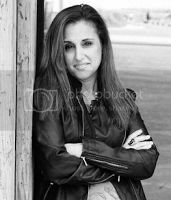 Professionally, Kristina has been active in the writing community as a member of several organizations such as Mystery Writers of America, Sisters in Crime and International Thriller Writers. She has also served as the New Jersey Romance Writers Literary Book Fair Chair and, most recently, the President of Sisters in Crime-New Jersey. Kristina holds a Masters Degree in Psychological Counseling and a Senior Professional Human Resources Certificate, working in both fields throughout her business career. Personally, Kristina is married and doggie mommy to Pekingese and Shih-Tzu pups. Although a New Jersey resident, she dreams of one day moving to Hawaii and living the ‘Aloha’ way. When she is not writing, she spends her time reading, watching paranormal investigations, rooting for her West Virginia Mountaineers and relaxing with her loved ones, wine in hand.